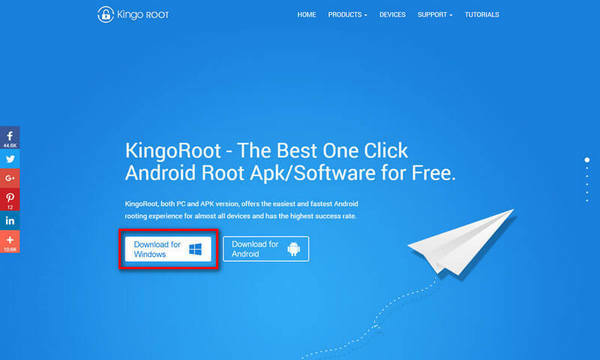 KingoRoot Android is the best one-click Android root tool for devices running 4.2.2 including hot selling devices like Samsung GT-S7582 Galaxy S Duos 2, Huawei Y330-U11 Ascend Y330 and else. KingoRoot provides the easiest and fastest one click root solution for Android 4.2.2 Jelly Bean devices. IMPORTANT Please try KingoRoot.apk first. Your device may rooted without computer by using this app. Enable the unknown sources in setting menu. Download KingoRoot.apk file into your device. By the time download finish, install and launch KingoRoot. Press “One Click Root” when you see the button. Wait until you see the result. It is better try more than once if root failed for different rooting methods. If still failed after tried many times, refer to KingoRoot Android(PC Version), which has a higher success rate than app. An original USB cable or one with good quality. Download, install and launch KingoRoot. Free download the latest KingoRoot Android (PC Version). After download finished, install and launch KingoRoot Android PC Version. Kingo will automatically detect & install driver for you. Make sure network connection is active so that device driver can be downloaded. If you are using Windows 8, you may need to change some settings first. Pay attention to a prompt window on your device screen. Tick “Always allow from this computer”. If you don’t, you will probably get yourself an OFFLINE DEVICE. Before you start to root your device, there are some things you need to know first. Every coin have two sides. Rooting your Android has its own advantages and at the same time disadvantages. It is a matter of weighing pros and cons. Click “ROOT” to begin the process. KingoRoot will employ multiple exploits on your device,. The root process will probably take several minutes. In the rooting process, your device may be rebooted several times. Be patient, it is normal thing. And once it begins, DO NOT touch, move, unplug or perform any operation on your device. Getting results, succeed or fail.